S’more Peeps – The best part of these adorable treats … there is “no baking” required! Just “gather” ingredients and put them into treat bags! After baking chips are melted, insert pretzel rod into candy and swirl to cover. Cool until candy hardens. NOTE: I placed my cookie sheet filled with pretzels into the freezer to harden. If cooling in freezer, do not place pretzels in favor bags until coating has reached room temperature to prevent condensation from forming in favor bag! Slide candy coated pretzel into favor bag and close the opening by tying with a 7-8″ strip of black tulle and Halloween ribbon. “Unfurl the tablecloth, set out the plates! Glitzy Spider Napkin Rings add a little bling to black and white napkins covered with bats. Dangling from spooky branches painted black our Treat Bags are filled and ready to be “picked” by our kids and grand kids, coming for Halloween dinner. Hope you have a spook-tacular Halloween with plenty of “sweets” and even sweeter moments to look back on. 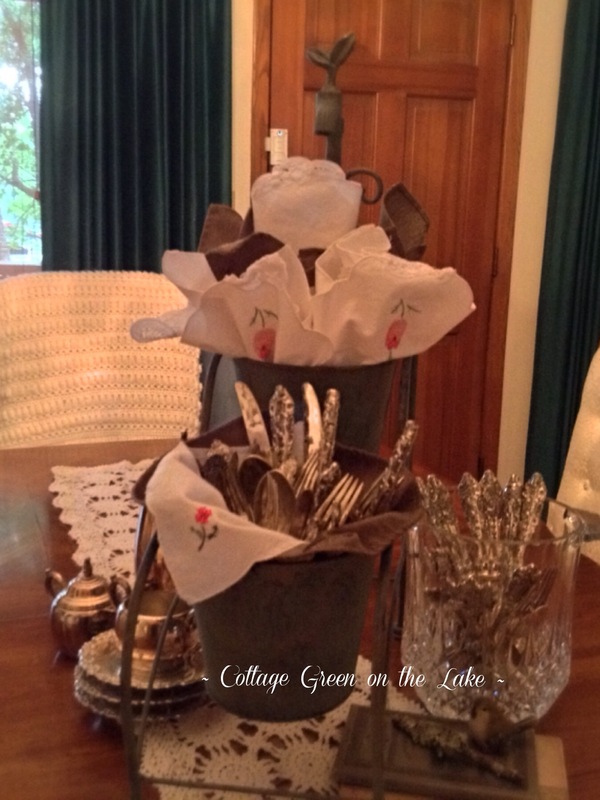 Garden-themed tabletop caddy … hold and “plant” your silverware and napkins. My husband, Richard, bought this darling Verdi Green planter for me from T. J Maxx, 2 weeks ago, during the hottest part of our “Dog Days of Summer” here in East Texas. We had 8 days in a row with temperatures in the 100’s and the heat index being anywhere from 106-109 degrees! The following week we were blessed with much cooler weather and a week of rain! (a cause for celebration in August, typically our hottest and driest month here in East Texas!) I was so tickled with my new planter, I couldn’t wait for cooler temperatures, or for the rain to stop, before I filled it! Instead of scooping up potting soil and filling the charming pots with flowers, I “planted” my silverware and napkins in the metal pots and made the planter the focal point of my garden themed tablescape and set it atop our dining room table! I didn’t want the top bucket to appear top-heavy, so I filled that flower pot, with napkins. 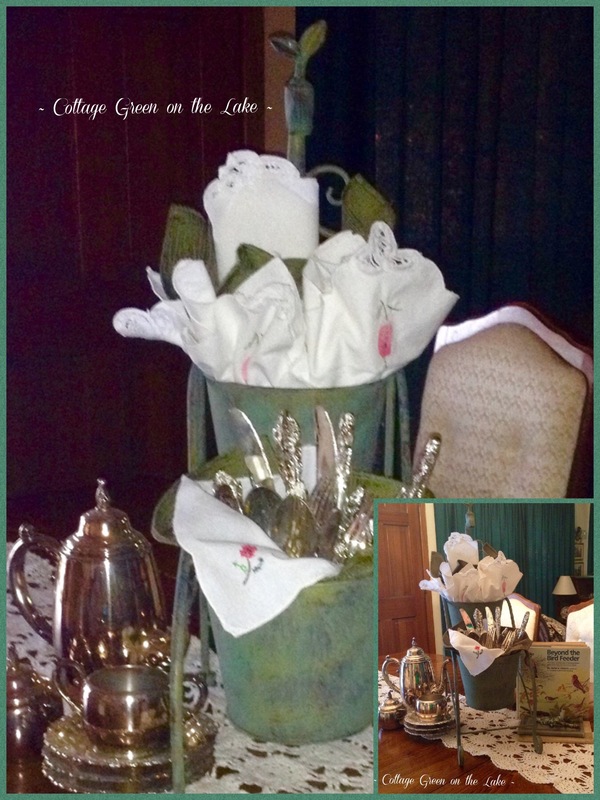 There, under the sweet little spigot and “blooming” like flower petals, I tucked in white embroidered napkins trimmed with a simple lace corner and a single, pink flower. 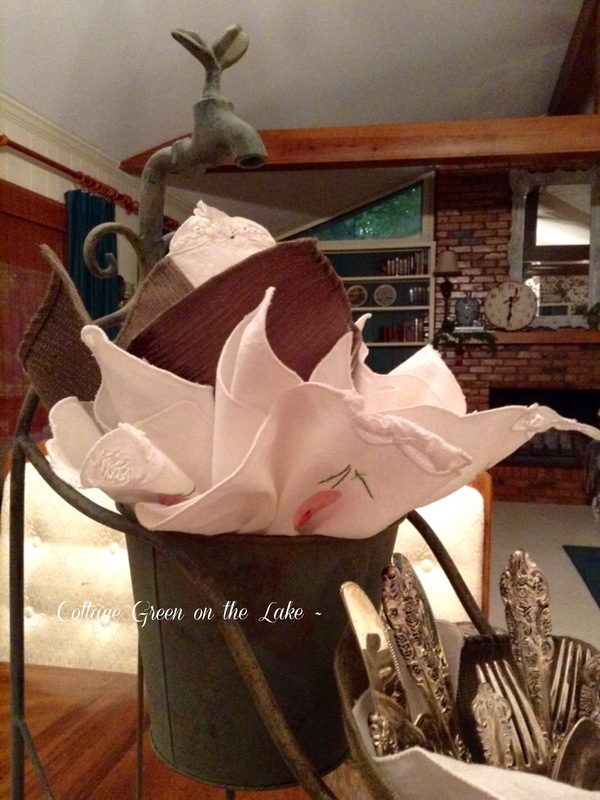 Then I “planted” a few sage green napkins to match the green of the flower pots. 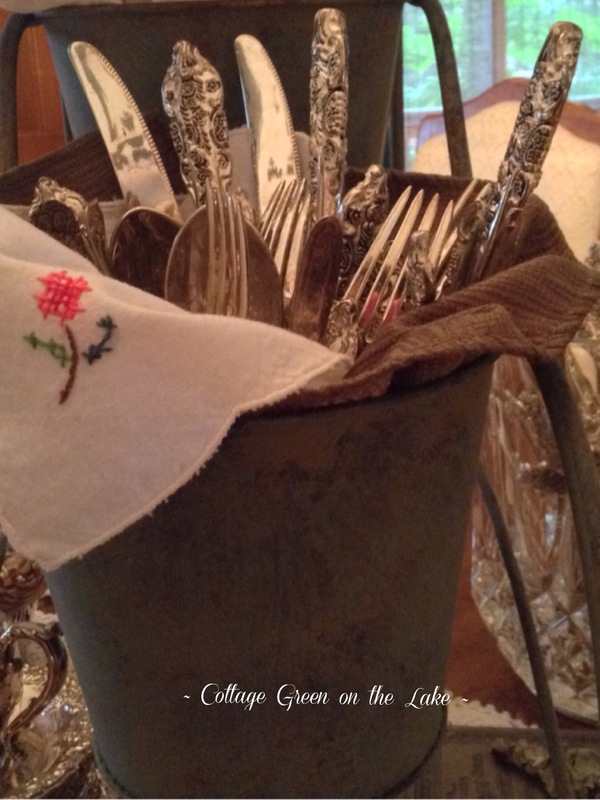 In the lower bucket, I “softened” the look of the metal before adding my silverware by lining it with 2 napkins, one sage green napkin and one white embroidered napkin. Then I randomly placed my cutlery in a seemingly haphazard way … some handles up, some down, to create a casual, but elegant display. I love the embellished and intricate ends of the silverware, but I also love looking at the gleaming, shiny, blades, tines, and scoops! ﻿A crystal vase holds additional pieces of silver to the right of the cascading flower pots and keeping with my garden theme, I placed two tiny antique books and topped them with a teeny bird and a piece of bark I found in the backyard that was covered in a lovely colored lichen that blended perfectly with the green tones of the flower pots, books, and bird. I tried out a different look and added a little color while still maintaining the garden theme. In lieu of the crystal vase filled with cutlery, I displayed two of my favorite bird books … “A Complete Guide to Bird Feeding” and “Beyond the Bird Feeder” both wonderful books illustrated with pictures and written by John V. Dennis. Which display do you like better? 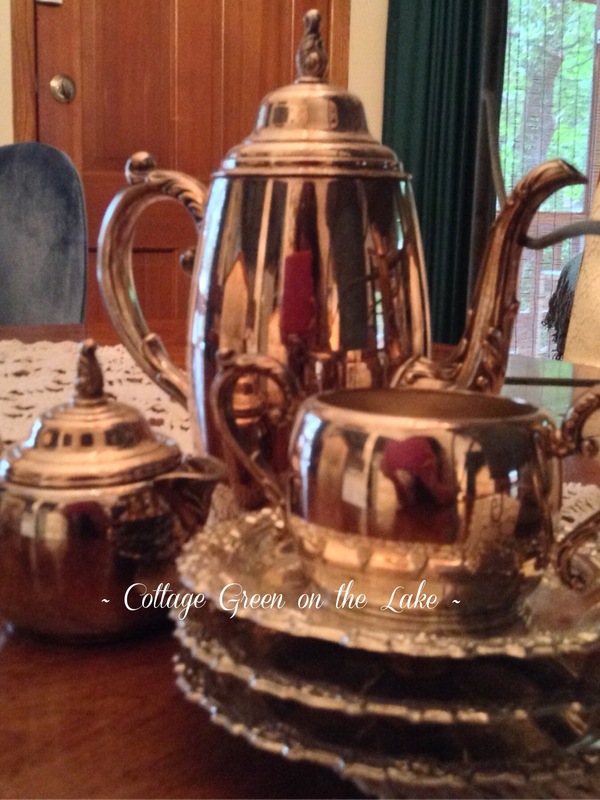 To balance out the left side, I placed a silver coffee pot, a silver creamer, and adding some height, I stacked some miniature silver chargers and placed the silver sugar bowl on top. Hope your enjoying these last days of summer and that you are managing to beat the heat, wherever “home is” for you! I’m anxiously awaiting to see the first violas, snapdragons, pansies and flowering kale of the season … and my favorite chrysanthemums and purple asters! Thank you for spending a part of your day with me! 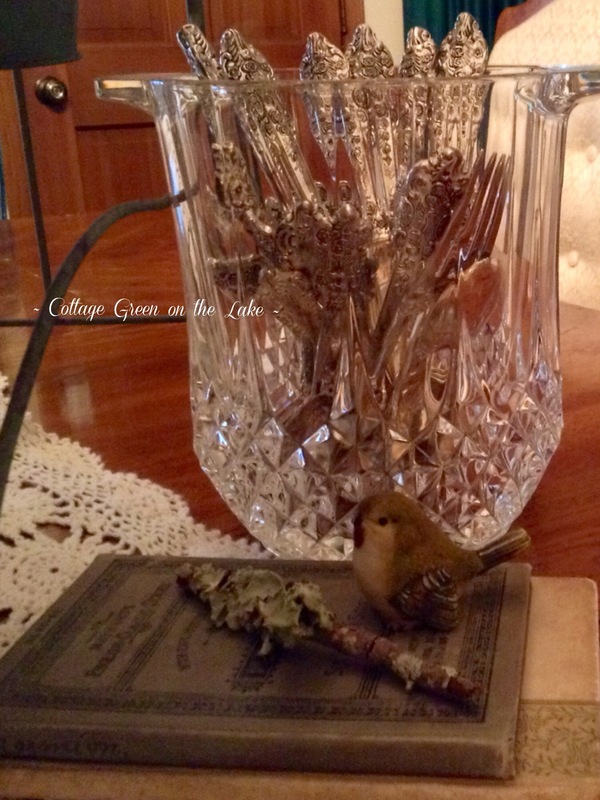 Author cottagegreenonthelakePosted on September 14, 2016 Categories Home DecorTags A Complete Guide to Bird Feeding, Beyond the Bird Feeder, cottage, garden, home decor, John V. Dennis, planter, T.J. Maxx, tablescape, verdi greenLeave a comment on Garden-themed tabletop caddy … hold and “plant” your silverware and napkins. Living on the lake, the scenery just beyond our window panes is always the focal point. 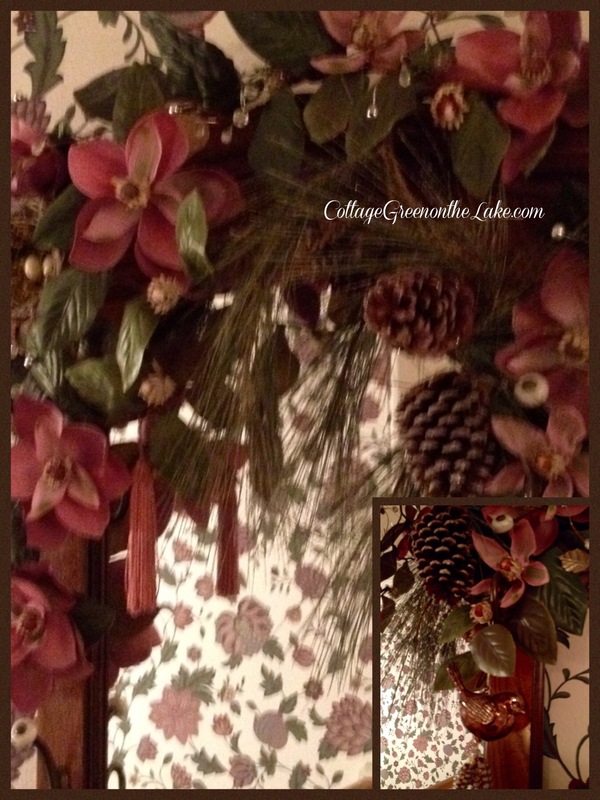 The beautiful views outside make decorating “within” a challenge. So, rather than compete with God’s artistry outside … I try to enhance those views by bringing the outside … in! 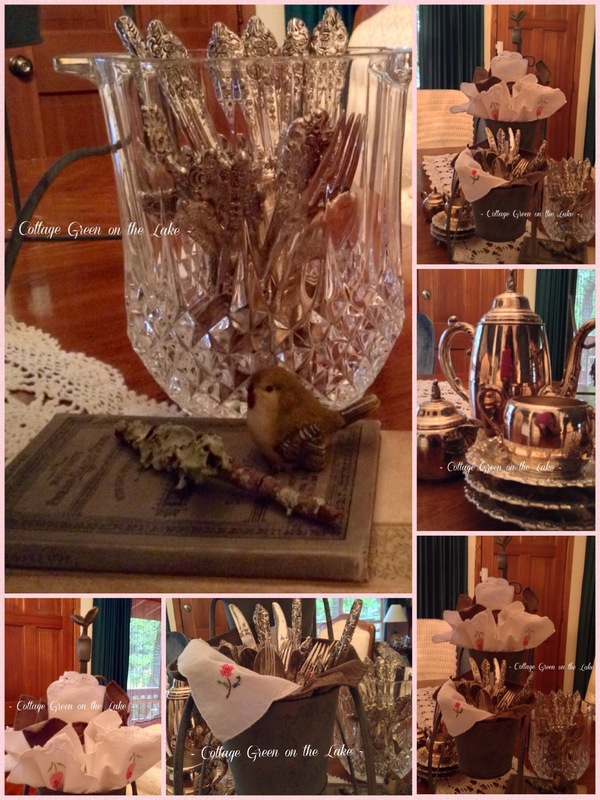 Thinking about the “feathering of our nest” … I took pictures of all things “birdie” throughout our home. I wanted you to see how easy it is to incorporate items that are typically associated outside of the home … in our decor. A cement cherub, playing a fife, looks “at home” and as angelic atop our hall tree, as he does in the garden. A bird, made of cement, looks quite content sitting at the base of a crystal vase, among a selection of nesting materials. A rustic bird stands near a crystal ice bucket and a tin bucket covered in moss … nearby, an unusual birdfeeder! A little silver bird is perched on the edge of his nest, that’s filled with millet. Above him is a darling cake-plate, adorned with 4 sweet birds and a collection of salt cellars. A bird dangles from a pine-flowered swag. Clutched tightly, he holds a tiny offering of pinecones. A moss-covered nest with a sprinkling of flower buds looks “sweet” in an ornate sugar bowl. 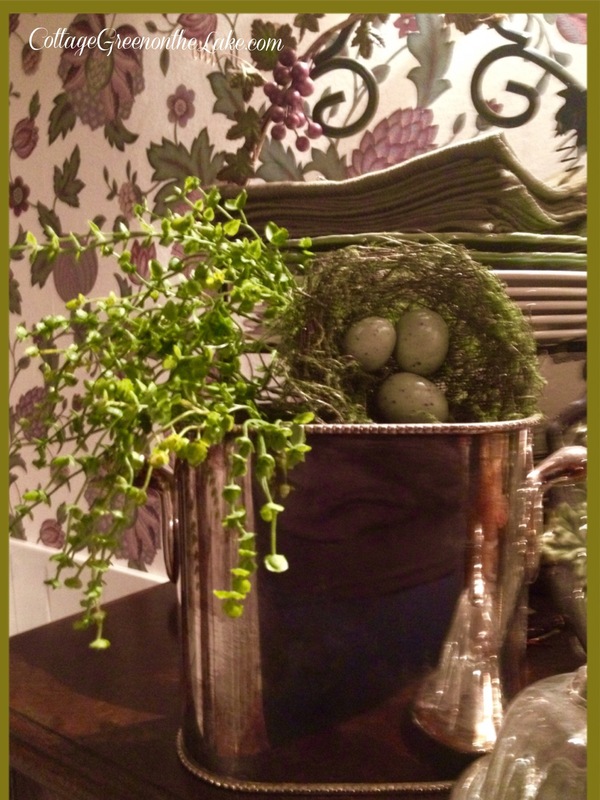 Tucked among some greenery in a silver bucket, a nest adds visual interest to a stack of plates and moss-colored napkins. What do you enjoy collecting? Whatever your passion is, use those items to decorate and “cozy up” your home. 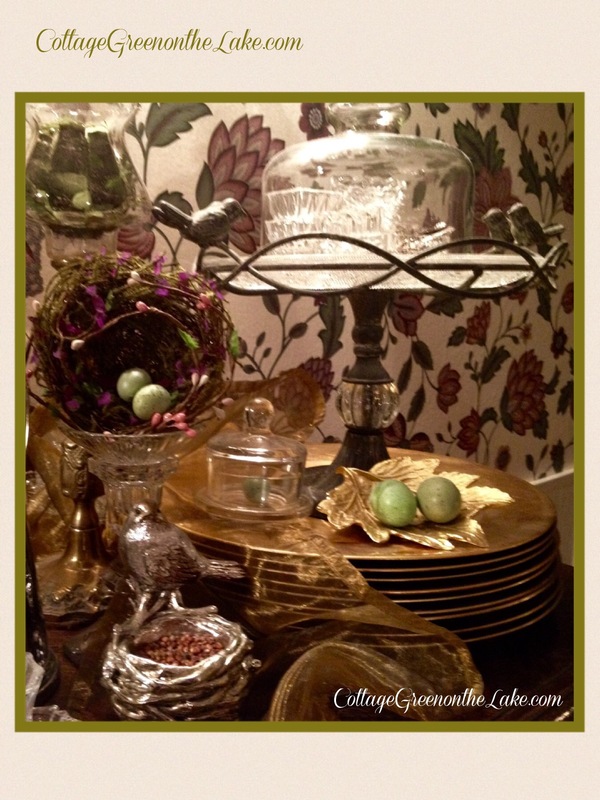 I hope you have enjoyed seeing our “feathered nest” and the unexpected ways you can bring “the outside” into your home! 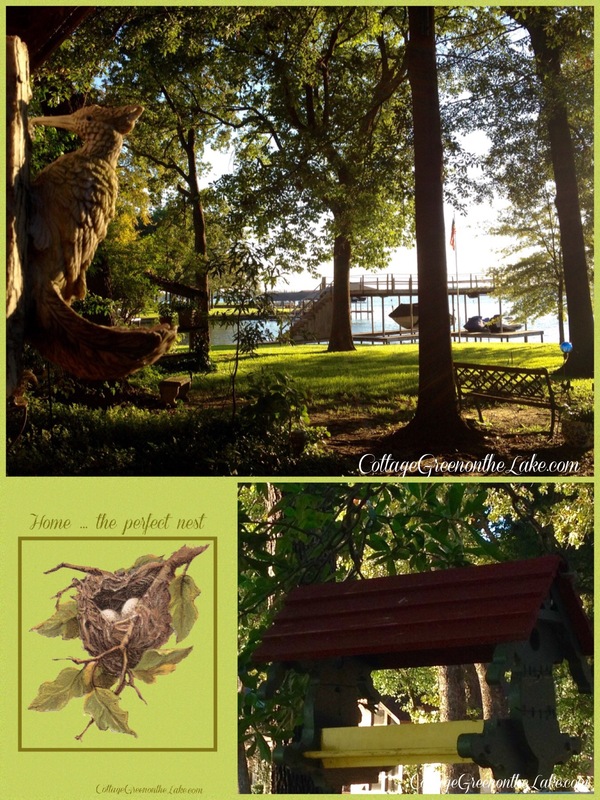 Home is … the perfect nest!